Christian Dior AW2016 Haute Couture Collection is where Lucie Meier and Serge Ruffieux return to the source, the foundation of the House: the ateliers. Symbolically, their collection is presented in the couture salons of 30 Avenue Montaigne - an intimate setting for a collection dedicated to the knowledge and superlative craftsmanship of Dior’s ateliers, the poetry of their work. 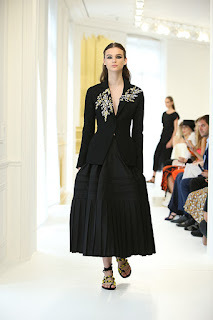 The Bar suit, the essence of Dior, is the principal inspiration. Like the beating of a heart, it punctuates the entire collection. But the inspiration goes beyond form, the signature silhouette of hourglass jacket and full skirt, encompassing every aspect of the Bar. 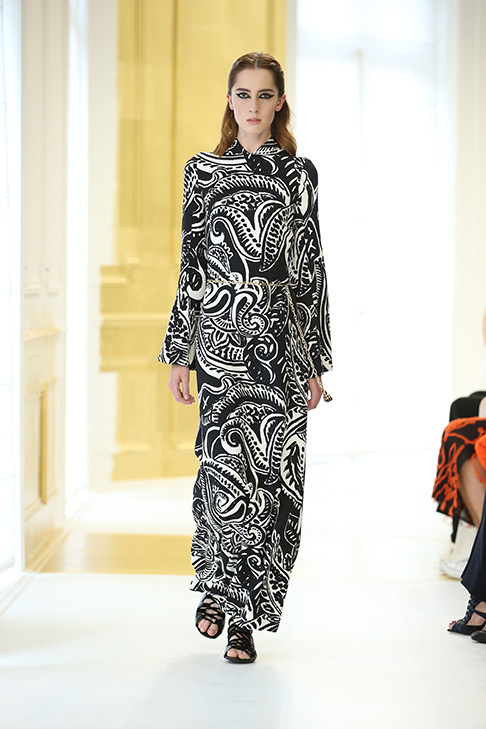 Thus the entire collection is in the original palette, brilliantly contrasting black and white. Black and white holds a particularly important place for Lucie Meier and Serge Ruffieux. The combination is the most elemental representation of duality: masculine and feminine, history and modernity. The designers also see the contrast as a metaphor of their own relationship, how through the dynamics of difference a whole greater than the individuals is created, working together to find a harmonious balance: two perspectives becoming one. Monsieur Dior himself adored the juxtaposition of the two: “White,” he said, “is simple, pure and goes with everything,” while declaring, “I could write a whole book about black”. Such sartorial quotes nourished the monochrome palette of the fabrics and prints, the latter reminiscent of a mid-century couture photograph by Horst or Penn come to life. Like a painting by Picasso when he chose monochrome over colour to better focus on structure, the collection becomes a study in form and shape. Indeed it is the Bar’s structure that is also reinterpreted. Meier and Ruffieux began with the skirt, experimenting with pleating and draping in the evening dresses and long skirts. Their linings, layers of organza to add body, become garments in their own right, like X-rays of archive garments. The New Look’s volumes are made lighter, more contemporary: it is the spirit of the atelier flou fulfilled by the atelier tailleur. The jacket itself is deconstructed, either elongated at the basque, or drawn in vertically and gathered, adding animation and movement, a new look, a Dior spirit. The only colour, the single embellishment, is sculptural gold embroidery, inspired by the works of César and Claude Lalanne, a nod to Art Brut. Jean Cocteau described Dior as, “This nimble genius unique to our age, whose magical name combines God and gold <Dieu and or>”. Gold accents the collection, adding emphasis: the embroideries are worn like jewellery. 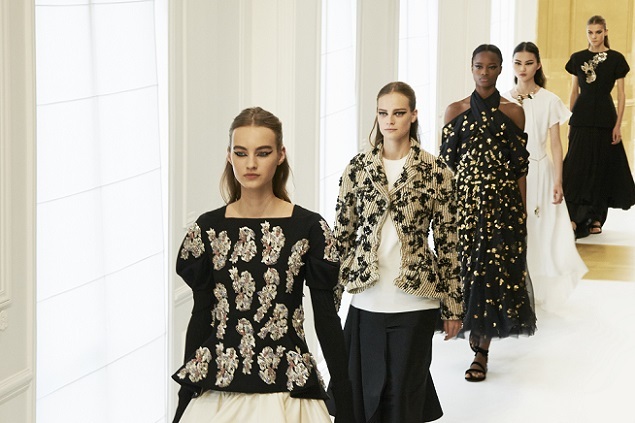 For the show, the Dior salons were also jewelled, covered with gilded panels, while the jewellery collection echoes the embroideries’ sculpted forms and asymmetric application. Everything here celebrates the incomparable expertise of the Dior ateliers, the source of all beauty.